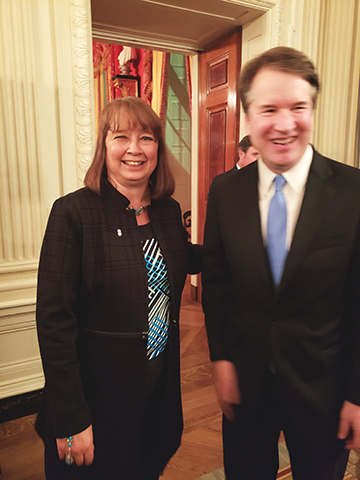 NRLC President Carol Tobias attended last night’s formal swearing in of Justice Brett Kavanaugh at the White House. I had the honor and the privilege of representing National Right to Life at the White House last night, to see Brett Kavanaugh sworn in as the newest member of the U.S. Supreme Court. Prior to President Trump and Justice Kavanaugh entering the room, Senate Majority Leader Mitch McConnell, with Senator Orrin Hatch by his side, entered to a standing ovation. The audience recognized that McConnell’s persistence and steadfast leadership kept the confirmation process on track, culminating in this joyous occasion. Other justices of the Supreme Court had front row seats. Justice Anthony Kennedy, whose retirement set in motion the events of the last couple months, entered with the Kavanaugh family and administered the oath of office to the new Justice. The room was packed with administration officials, allies of the administration, and many friends of the Kavanaugh family. I met a man who has known Kavanaugh since the age of 13, when they were both students at Georgetown Preparatory School. They remain close friends almost 40 years later. I had a chance to visit with former Attorney General Ed Meese, and I had the opportunity to tell the widow of Justice Antonin Scalia, Maureen, how much we appreciated her wonderful husband. And then I got to meet Justice Kavanaugh and his family. On behalf of all of NRLC’s wonderful volunteers and supporters, I told them that we admired their courage through the last few weeks and said that we had been praying for them. They were grateful for all the prayers offered on their behalf over the past several weeks. This event was a wonderful beginning to what I hope will be many auspicious years on the Court for Justice Kavanaugh.